No sub-freezing temps anywhere in view, with rain on the way. Last night it was twenty degrees here and the rain barrel made a half-inch of black ice, and by noon it was still there but penciled. The surface on Mace’s was fast and grippy, but the wind used up all it had yesterday and didn’t save enough for today. 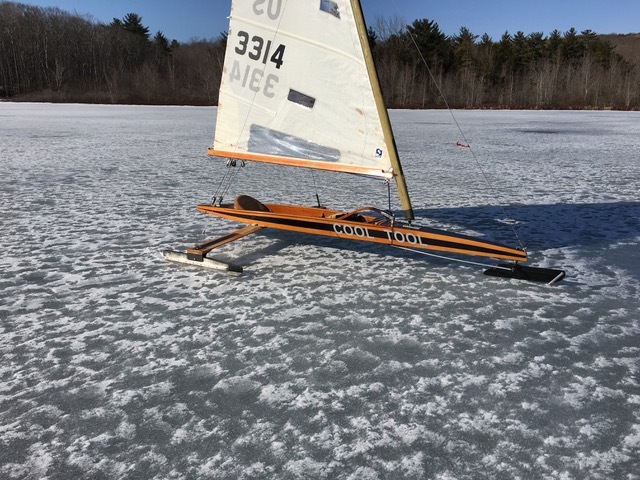 But there were just enough nice gusts to keep the iceboater interested on an upwind-downwind quarter mile course. Great for practicing starts, chasing shifts and mark roundings. The pond is right on the road so people would stop and come down to see what iceboating was all about. A great place for sport outreach. Lloyd always said that if you’re on a small lake, marks make it much more interesting. Marks are supposed to be orange, but AN orange will work in a pinch. Spring meeting planned for May 4 or 5, but we haven’t yet nailed down a venue. Hoping for Damariscotta Lake Farm Inn, as usual, but it’s complicated. Stand by for an update soon. 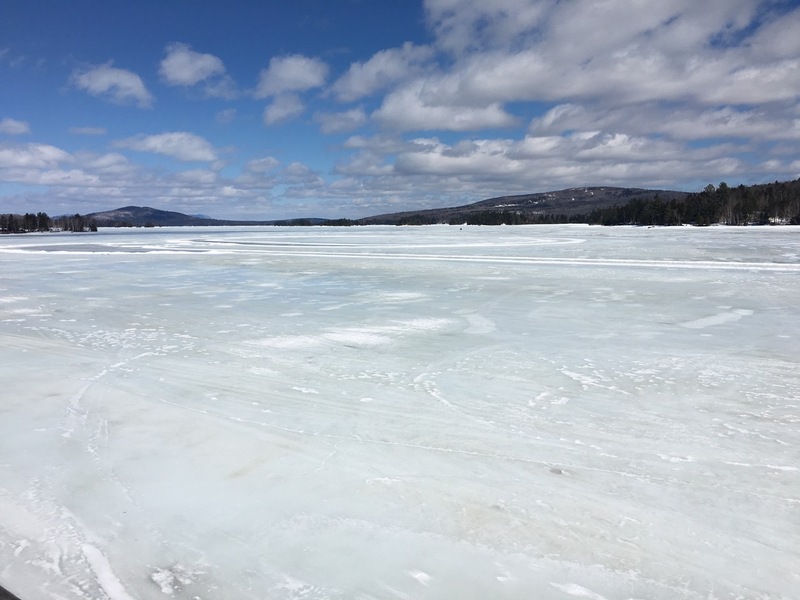 In spite of our recent setback at Moosehead, local ice continues to hang on. 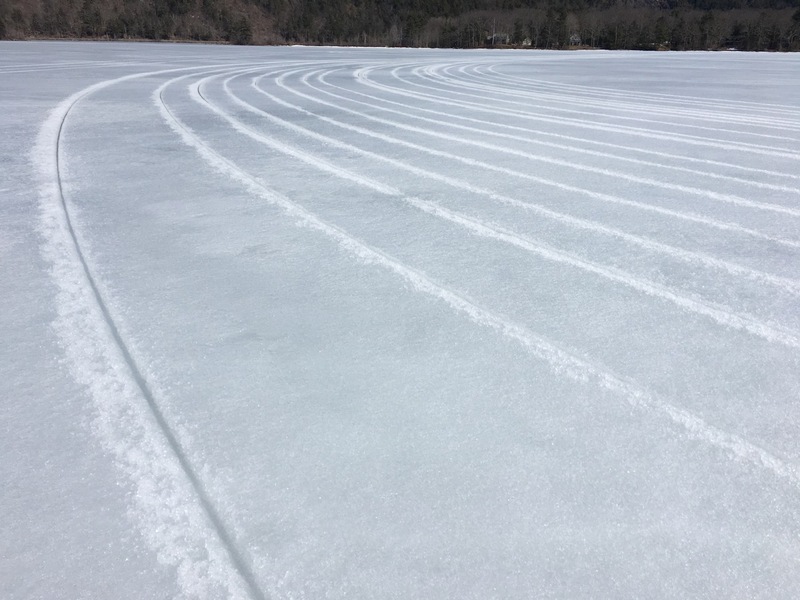 Megunticook’s edges are rotted out, but on Hosmer Pond and Maces Pond you can still walk right on to 12″ of hard ice. Nights below freezing and sunny days in the thirties have improved the surface. 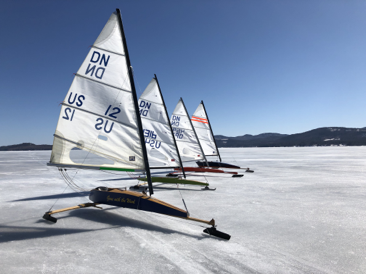 Hosmer Pond was sailed Tuesday and today, although today was cut short when the sailor finally realized what Gale Warning actually means. It means boat and body breaking gusts swirling down over Ragged Mountain. On opening day of this season we sailed on tiny Maces Pond. 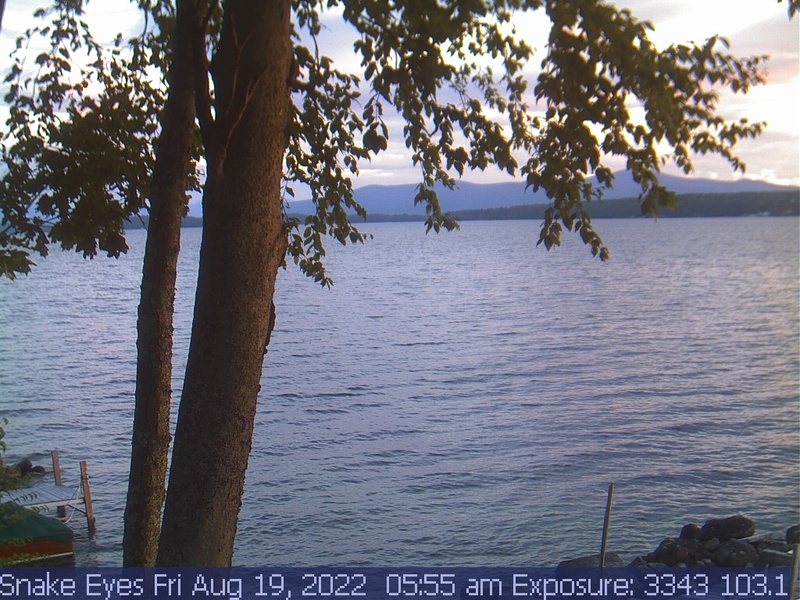 It seems fitting to go out the same way, and as tomorrow looks to be really it, for sure this time, nothing below freezing coming our way, there will be at least one boat setting up there at around 8:30. It’s right on Rt. 17 on the right heading for Rockland. Carry on access. Another beautiful day in paradise. 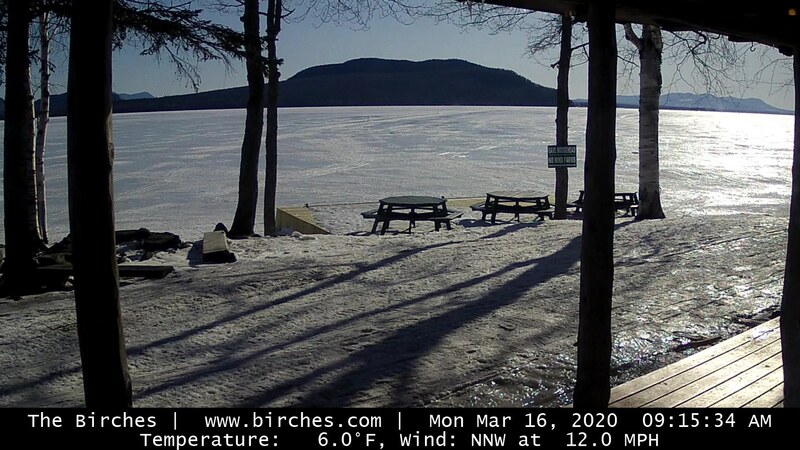 Moosehead Lake looked well recovered this morning, in spite of a bit of shell and slush around the edges. The surrounding ice was hard and wonderful. We had a nice downhill start and no sooner than we got wound up, deep, boat stopping shell appeared. It appears to go on for as far as we could see so we turned back. There was a plowed race track for spike shod cars there in the bay, and the infield was as nice as a skating rink, and a tad larger, so we did a couple a laps there before de-rigging and taking the boats to Rockwood. We found the shell to be nearly healed there, but we also found hidden slush holes: Holes with no bottom covered with a little snow. There were quite a few little snow piles of no consequence, but which ones hid the holes we could not tell. Especially if we were to be sailing fast in the 20kt.+ wind. We were indecisive at that point until we were given a sign: a snowmobile mired in a distant slush pit. All revved up and going nowhere. Optimistic fools we might be, but foolish fools not. We had lunch and hit the road for home. Spring meeting planned for early May, details to follow. 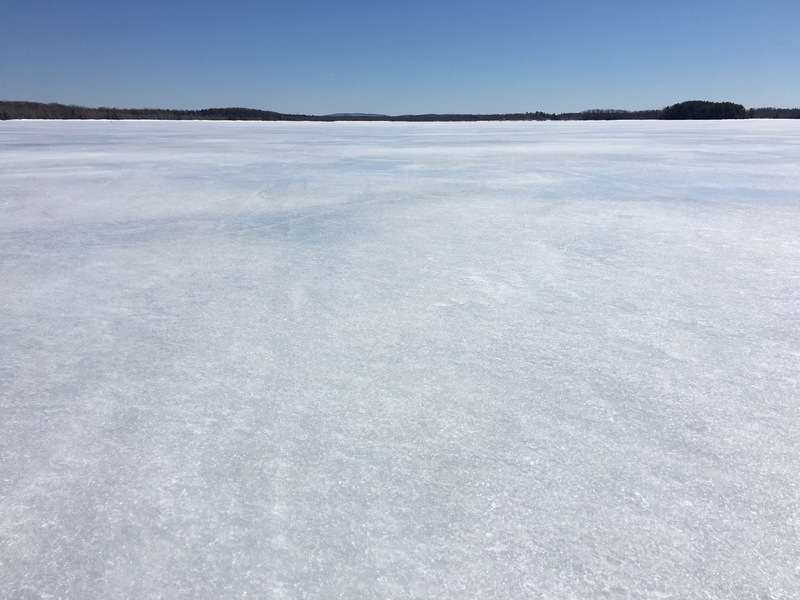 By the way, the ice in this photo is over four feet thick, measured this morning in a nearby fishing hole. Just sayin’….. Tomorrow morning at 9:00, Kelly’s Landing, Greenville Junction. We’ll have a look, see if it’s sailable, and check at Rockwood as well. If the surface is no good we’ll push on to South Twin, which looks less wet today. The plan is to stay up there somewhere and try again Tuesday. Keep your eyes on South Twin. This coming Monday? Decided that racing was probably not going to happen after T’s report from Pushaw. We heard about the possibility of a hard way attempt on Winny. Monday night we saw the announcement that hard way was a go for Tuesday. Decided that driving up to my place Monday night not necessary now that we were to sail on Winny, we agreed to get an early start and we did. As I started driving to Wolfeboro, a 1.5 hr drive for me, I received a text from Eben that he was about 2 hrs from Wolfeboro all cool. There was a good crowd on the ice when I arrived, I believe about half were set up from the previous day. There was a large crack/opening separating the two pit areas. Charles came over to the area I was in and announced hopes of casting off about 0900. Eben did arrive about 15-20 minutes after me so we were both about ready as he is faster setting up (and around the course!). We all had a meeting to discuss the pressure ridges and other hazards that the scouts had found the previous days. And where we should meet on the ice at various stages in the crossing. Eben and I met all the others at the check point, I believe was Parker Island off of Wolfeboro Neck. And off we all went, the wind was robust and all was good. The first two ridges that we came to were crossable with the common precautions, slow, stop inspect and find a good spot. All was good, the last ridge was marked at a good spot by Lee and Karin the previous day, and indeed was still a good crossing. At that point all 10 boats were across and sailing. Charles and others counting boats to be sure the fleet was complete. From the last ridge crossing, we were then entering the bay that becomes Center Harbor. 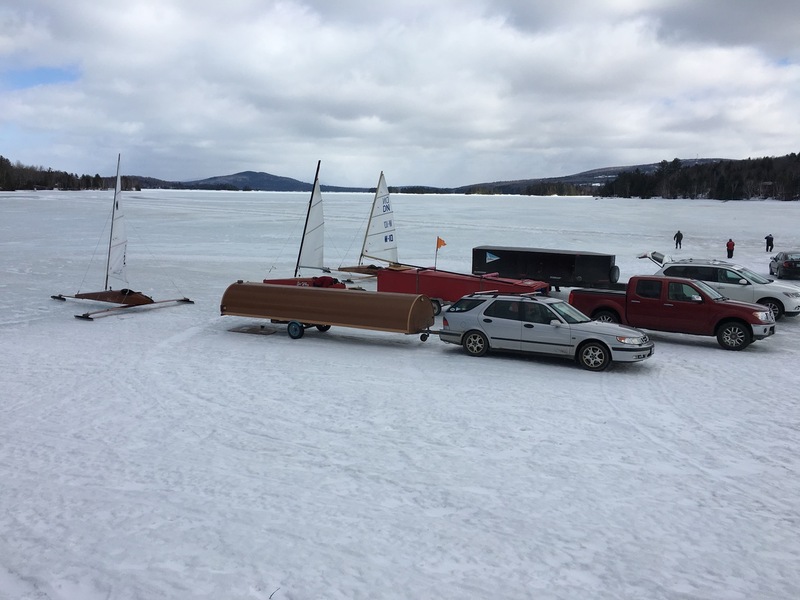 We sailed in and stopped our boats off the beach and next to the Mount Washington, not too close as surrounded by freakin’ bubblers! 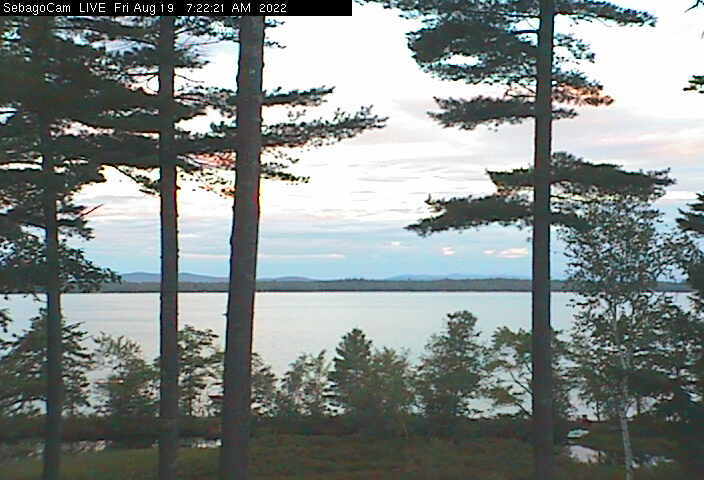 As I said we had been counting boats after happenings, and arriving at Center Harbor is a definite happening. We had a missing sailor, Ramblin’ Roger was far enough back that we could not see him. Several of the Fleet went to find him, I am sorry I do not remember all that went, but I know that Eben did. They collected all the tools and spare parts that we had, and sailed back out into the bay, down wind so they were movin’. As I was not there, I cannot describe the specifics. I do know it was Rogers headstay that failed. Fortunately, one of the spare parts that they had was a side stay. They were able to make it long enough using some small kevlar cordage that they had. I did not time the event, but estimate it was less than a half hour when they returned, what a bunch! 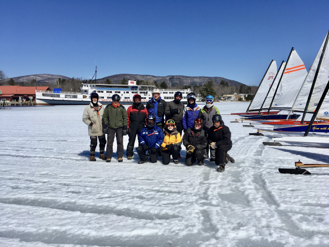 We talked, ate our lunches, checked our gear for the fast downwind ride back to Wolfeboro. The ice was indeed still firm, and that was great, as I did not bring my angles, and I do not think any of the others did either. 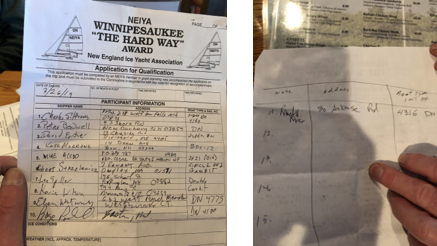 If I remember correctly it was right around noon when we left Center Harbor, the wind was still strong, and so the fleet did not head to Wolfeboro direct, but covered many miles in the bay going very fast on reaches as cruisers do. As time passed the fleet then crossed the ridge with the cairn marking the crossing. We then sailed on that piece of ice for a while, carefully crossed the next ridge. 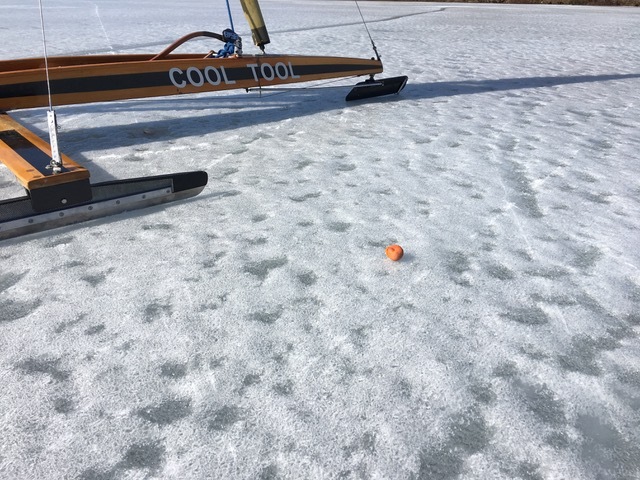 Along the way we hooked up with some alternative ice sailors using Kitewing and skis. One was Martin, he is a dealer who gave me a card with this info woolyman . There was another with an actual kite/parachute type thing, and I do not recall what he/she was riding. When I got to the loading area and was breaking down the boat I was dealing with the worst part of the day ice wise. The pit area that I was in was 3 inches of corn slush. Kate saved the day, she had thought ahead and had a six pack of delicious Vermont ale that she was so kind to share.